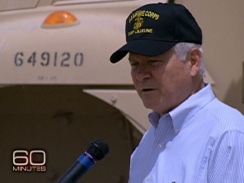 Secretary of Defense Robert Gates in his first interview since the killing of Osama bin Laden. Katie Couric also traveled with the secretary on a five-day mission to the Middle East that included a stop in Iraq. Tom Anderson is the Producer. Coleman Cowan is the Associate Producer. It’s not at all unusual to hear the Pentagon being criticized for its bloat, bureaucracy and spending binges. But what is surprising about the latest criticism is that it doesn’t come from an outsider with an anti-military agenda. It comes from the Secretary of Defense himself. Robert Gates has an impressive resume with more than 30 years of government service and he’s just announced he’s retiring next month.